For you locals, the journal club schedule for the fall semester has been posted here. It's open to anyone and everyone. What is journal club? The Origins Journal Club is designed for those interested in origins or the work of CORE to meet together and discuss recent literature or research results. The format is a short presentation (25-35 minutes) followed by discussion. Presentations can be a summary of a published article or an original research project and may be given by a professor or student. Journal Club meets Tuesdays at 5:00 p.m. in Mercer 139.Feedback? Email me at toddcharleswood [at] gmail [dot] com. There's more feedback on my hominid baraminology work at ARJ. This time it's a trio of critics: David Menton, Anne Habermehl, and David DeWitt [link]. Menton focuses on theological issues (although never clearly enough to precisely state his objection), and Habermehl is just angry. DeWitt offers some genuinely insightful comments, but he condescendingly likens my research abilities to those of a clueless undergrad. How sweet. So I've been out of town, and now school is starting up again. I'm teaching two classes this fall ("Biological Origins" and "History of Life"), so I'm gearing up for that. Meanwhile, I've got a paper to revise for publication, and two manuscripts to revise before I submit them (including that response to Senter I've been talking about). And for all you blog fans, I'm cooking up a fun series of posts that will be very, very entertaining. I'll do my best to get them ready for next week, but no promises. They'll be worth the wait, though. apes created by God.Ouch. I guess I know where I stand. Since I don't think sediba is an ape, I must not be a biblical creationist. Except that I am a creationist, and I'm not going to change. In any event, I'm really enjoying this sediba feedback. It's extremely revealing. Keep it coming! I was asked recently to explain the purpose of blogging, specifically what is the purpose of my blog. That set me to thinking about my own history with creationism, and what I wanted to accomplish with this blog. I suppose the question has a broader implications for the general motivation for blogging (which often escapes me), but I'm taking more along the lines of why I chose to blog about creation, evolution, theology, and science. First and foremost, this is an information channel for supporters of CORE. I've tried all sorts of means to keep people aware of the goings on at CORE, but there's nothing as simple and easy as blogging. Since I am first and foremost a researcher, I don't really like to spend a lot of time writing newsletters and such. With the blog, I just post stuff as I'm reminded of it. Very convenient. 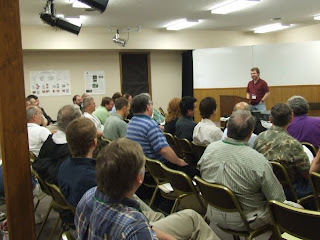 Paul Garner has a nice write-up of the BSG/CGS conference at the BCM website, complete with photographs. Meanwhile, there are lots of things going on behind the scenes, and I wish I could tell you all about them. But I don't think I can. At least, not yet. But if you are a person of prayer, I would appreciate your prayers at this time. I've had a few questions over the weekend about Phil Senter. People want me to respond to his paper. All of you who have written can rest assured that I have already composed a response, but I'm not going to publicize that response until it gets published somewhere. What can we learn from polls? Part of my job here at Bryan is teaching courses every fall semester, and part of that teaching responsibility is creating tests for my students. Over the years, I've discovered (often the hard way) that composing a good test question can be difficult. I've had students ask me during exams about what some of the words in my questions mean (I guess I have a complicated vocabulary), and occasionally I've gotten correct answers to poorly-worded questions that were not what I was looking for. Even more puzzling is the common habit of students to answer one question one way and a related question a different way, even though the answers they give are contradictory. It's bizarre. I got the latest Acts & Facts in the mail last night, and I read Jeanson's latest article about ICR's life sciences team. This month, he's talking about biological change, and if you haven't read it, you should. Because the rest of this post won't make sense until you do. So go read it now if you haven't. What a great conference! Thanks to everyone who helped out and presented, and especially to those who stepped in to help make airport runs after the college van broke down. I had such a good time getting re-energized for the work ahead. We've got lots of great ideas for the future, and I'm excited about seeing them to fruition. Meanwhile, for those of you keeping score, the final day of the conference opened with my own talk on terrestrial mammal families, followed by talks on mutations and halobacteria. The afternoon was spent going through the Coconino talks, which were extremely interesting. I'm excited to see that project really paying off.